Border collies are herding dogs, which means they're kind of obsessive intrinsically. A certain level of obsessiveness is necessary to meticulously round up sheep for a lifetime. 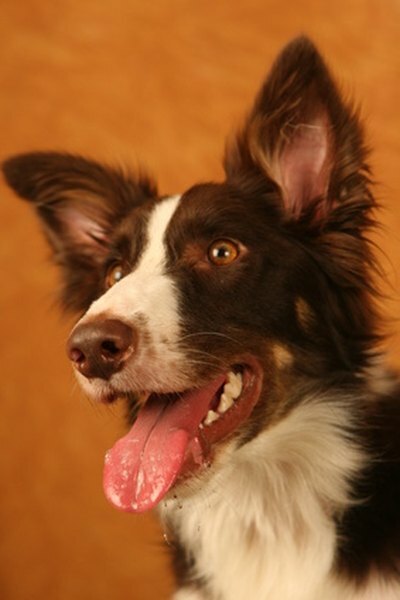 Whether you're keeping a collie as a working dog or as a pet, obsessive behavior can reduce the dog's quality of life. Approximately 2 percent of all dogs are believed to suffer from obsessive compulsive disorder, also known as canine compulsive disorder or compulsive behavior disorder. Stress in a dog's environment can lead to the development of compulsive behaviors. Symptoms of OCD in a border collie include snapping at flies, chasing his tail, spinning around, excessive barking, flank sucking, hallucinating or eating other animals' feces. You can reduce the likelihood of your collie developing OCD by reducing stressful factors in his environment. Close confinement or extensive chaining can cause a collie extreme stress, so make sure your dog has regular off-leash time and room to roam. Social groups are important to border collies, so changes in your family setup or in relationships between your collie and other pets, can cause stress. Give your collie plenty of opportunities for physical exercise each day, and make sure your dog has a chance to interact with other animals or humans throughout the day. Being isolated can be very stressful for a border collie. If your collie is acting stressed and obsessive, you can help reduce these behaviors before they become destructive to your dog's health and happiness. Seek advice from a veterinarian about possible medical reasons for obsessive behaviors -- if your dog has a thyroid condition, for example, this can elevate stress levels and increase obsessive behaviors. Make your routine as predictable as possible for your dog, and make sure that every person in the household is consistent in their training and behavioral expectations for the dog. Some border collies respond well to calming massage, wraps, sunglasses or clothing to reduce environmental stress, or synthetic pheromones that come in spray, plug-in or collar-treated formats. Sometimes you might be reinforcing an obsessive behavior by accident. For example, if you laugh at and praise your collie for chasing his tail, you are rewarding the behavior. It's likely your collie will continue or increase the behavior. You can stop reinforcing obsessive behaviors by ignoring them, thereby removing the attention that rewards the dog. Behavioralists refer to this technique as "extinction." For example, you might leave the room as soon as your collie starts to tail-chase. If your dog is chasing his tail as a means of getting your attention, he will stop the behavior when you are no longer in the room to reward or reinforce the behavior. In some cases, dogs may perform obsessive behaviors alone as a form of self-stimulation. In these instances, you need to stop any reinforcement or reward for the behavior -- to a dog, even your angry yelling if he eats poop may function as a kind of reward. You should remove the opportunity for the dog to perform the behavior -- for example, clean up any and all dog poop from your yard before letting your dog out to do his business. Limited use of a muzzle can prevent your dog from engaging in behaviors such as flank sucking, pica (eating feces) or fly-snapping. Do not leave a dog unattended in a muzzle.